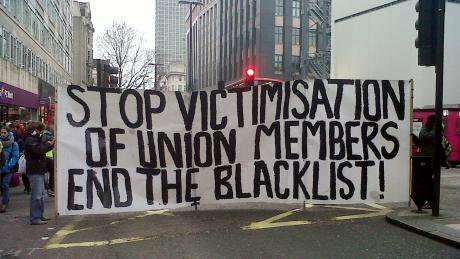 Last week the Metropolitan police admitted some of what trade unionists already knew about the activities of the secret state – that Special Branch had supplied information to corporate blacklisting organisations. The evidence was recovered nine years ago, the complaint was made six years ago and the report was completed two years ago. And finally this month the Metropolitan Police Service revealed, through gritted teeth, that Special Branch officers had supplied information to secret blacklisting organisations. The Met didn’t actually release the report, which had been sent directly to the Commissioner on grounds of sensitivity, only its findings. It also said that no officers would be disciplined as a result and it rejected five other complaints. This was the minimum it could do - but it is important because it officially acknowledges how police and private companies were entangled in political surveillance. Back in 2009, the Information Commissioner’s Office (ICO) raided the offices of an obscure organisation called The Consulting Association. It recovered files which revealed that for years up to 44 construction firms, including many of the UK’s most prominent names, had used the association to keep details on thousands of union activists so they could be denied work. In 2016 half a dozen of these firms admitted liability in court and paid millions in damages to more than 700 people. Blacklisting isn’t a new phenomenon but what was unusual was that the ICO recovered the original personal files and individuals could apply for copies. For the first time people could see what had been written about them and could also get a good idea of where the information had come from. Police collusion in blacklisting is not a new phenomenon. The most prominent example of a blacklisting organisation is the Economic League which ran from 1919 to the mid-1990s and was founded by a former director of Naval Intelligence. Reports by investigative journalists and boasts by its own officials showed systemic collaboration with the police and security services during its lifetime. The Consulting Association was an offshoot of the League, staffed by a former League official, and its original files were from the League. When union members started looking at their files there were sections which raised questions about how the information had been gathered. One person was described as “under constant watch (officially) and seen as politically dangerous”. Another had a police stop at an anti-fascist demonstration logged – and he wasn’t even a building worker. Members of the Special Demonstration Squad (SDS), a secret Special Branch unit which infiltrated activist groups, had joined unions and taken part in campaigns and actions. People they monitored also appeared on the blacklist. Several building company officials cheerfully admitted to meeting Special Branch contacts. The ICO investigator who broke the blacklist, a former policeman, told Parliament that there was information in the files that could only have come from the police. He later characterised to me the organisation of the files as very similar to a police local intelligence set up. As a result the Blacklist Support Group complained to the Metropolitan Police in 2012 with six specific allegations. In its statement the Met Police admitted: “Sections of the policing community throughout the UK had both overt and covert contact with external organisations, including the Economic League, for reasons stemming from crime reporting and the maintenance of public order and the prevention of terrorism.” This manages to acknowledge what had become incontestable. However the statement goes on to say the report (remember, we haven’t been allowed to see that) rejects the other complaints. It specifically exonerates the SDS from colluding with blacklisters and says the ICO investigator is just plain mistaken. The statement above also rolls out a useful and well-worn smear to defend the connections with blacklisters – that this was about crime or terrorism. An analysis of the Consulting Association files shows that time and again the first item in them is an individual raising health and safety concerns. It was legitimate union activities that got you noticed. Currently there is a judge-led inquiry into the activities of the SDS of which the Blacklist Support Group is a core participant. The Met Police statement kicks any further investigation over to that inquiry which has itself been running for three years and yet to take any substantive evidence. Last week 60 core participants walked out citing a lack of faith in the judge and the effectiveness of the process. Instead a full public inquiry is demanded. And yet campaigners are continuing to hew nuggets of information about how the secret state has been targeting activists. The six-page Met Police statement is carefully worded to suggest many fruitful areas of further investigation. The inquiry released information showing a former SDS officer went on to work for something called the Industrial Intelligence Section. And the Undercover Research Group is charting the activities of these spycops based on open sources and evidence from activists. The Met Police statement has put a finger in the dam but the revelations are likely to continue.